The Solution is a brand-new ab exercise machine from Body by Jake, the same company that brought us the popular Tower 200 home "door gym," the Cardio Cruiser Plus, and the Shadow Boxer Knockout "body workout" system. Although the infomercials have just started to run, there's already a big demand for Body By Jake Solution reviews online. 1. It looks freaking FUN! Let's face it, many infomercial fitness products simply look boring as hell. The Solution is not one of those. Whether it works or not, performing crunches on something that looks like a dang virtual reality video game controller seems like it might be a great idea. 2. Apparently it "knows what you want to do... even without you being on it!" We're not sure it's a good thing that an exercise machine -- other than a motorized treadmill -- can move by itself without any effort from the user. Or that it "knows" what we want to do... mind-reading exercise machines freak us out! 3. It looks like it could be effective. In general, abdominal movements that involve the upper abs, lower abs, and obliques do strengthen the core/midsection muscle area well. Also, the Solution machine appears to allow you to move in multiple planes of motion, always a good thing. But we're talking about strengthening and toning the abdominal muscles here, not burning fat. 4. The whole "Gravitational Linkage" system looks interesting... but it appears to allow the user to operate the device using his or her arm and shoulder muscles almost exclusively. 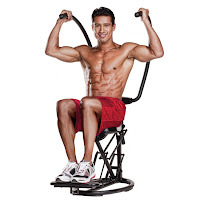 If it's an "abdominal" machine why does it involve so much arm/shoulder power? 5. If this is truly Mario Lopez's workout, Body by Jake is gonna sell about 10 million of these things. 95% of the guys in the world want to look like Mario... and 99% of women want their husband/boyfriend to look like him too! As cool and fun as the Solution looks, we're not sure if it's worth the price (currently about $269.00 - $315 depending on whether or not you pay in installments). In general, products like this are only worth the cost if they make working out more enjoyable... and lead you to exercise more often and/or more intensely. But no ab machine is going to burn off your belly fat and give you six pack abs all by itself. That requires a focused combination of dieting, cardio exercise, and proper strength training!